Here is the tale of a restaurant who did not have our commercial epoxy flooring. Audience beware: This story contains graphic sadness. Six years ago, these aspiring restaurateurs united beneath a single goal: to create the finest family dining experience possible. Driven by the rush of excitement that built up with each decision they made, they ended up speeding past some decisions they should have put more thought into, like what kind of floor to install. 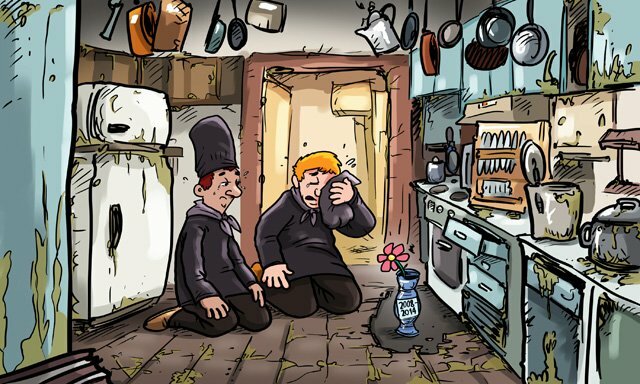 Sure, the tile they chose for their kitchens looked nice for the first few years but over time the spills, the heat, the cold, the traffic, and the inevitable dropping of heavy pots and utensils combined to wreak havoc on it. One patch had been subjected to so many hot spills that it was pocked and stained, another was worn down by the harsh cleaners used to deal with the nightly carnage of their tomato sauce station, and a third took on a rather unfortunate odor that they haven’t been able to identify. At first they tried to ignore it. Maybe if they cleaned a little harder, if they were a little more careful, or if they placed mats over the worse spots, then it would make it to its tenth year. They poured hours into keeping it clean, checked its cracks and corners for signs of bugs, disinfected everything. Unfortunately, the damage had been done. In the floor’s sixth year they knew there was nothing left to be done for it and they said their goodbyes. We share their story as a precautionary tale. It takes the right floor to endure the barrage of potentially damaging forces typical of a kitchen environment, something strong and durable that’s easy to clean and has other healthy properties like resistance to the growth of bacteria and other microorganisms. Something attractive, of course; nobody likes an ugly kitchen. Do not make the same mistake. Contact Everlast® Epoxy to learn about their commercial epoxy flooring. Please order your free quote and free sample using the details below. Would you like a FREE quote and a FREE sample?